Sometimes you know what you want based on what came before. That was the case for a couple who asked for the opposite of what they had in their last house. “It was very rustic and Tuscan. They just were over it,” says Cheryl Nestro, who helped guide her clients in a different direction. 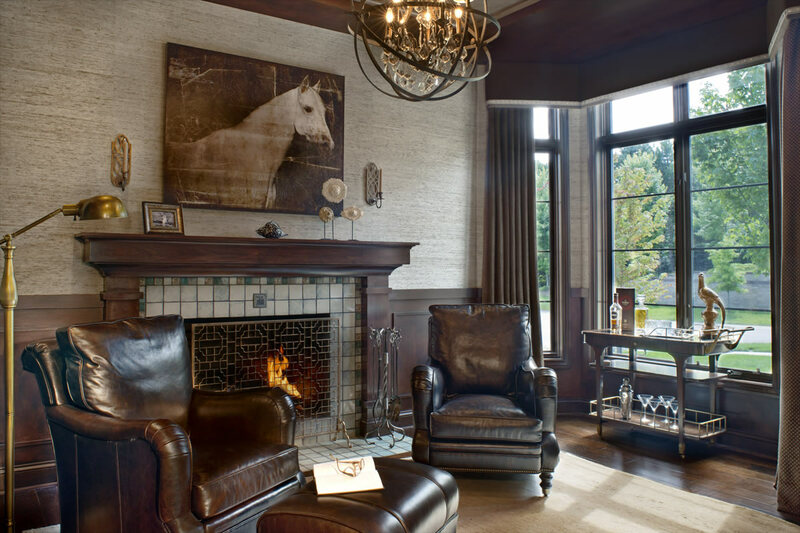 As the interior designer and president of Tutto Interiors in Northville explains, she was involved with the new-construction home from the get-go. The roughly 6,500-square- foot Tudor-style residence features transitional interiors. “We used some modern and some traditional just to kind of give it a mix,” says Nestro, who got on well with her clients. “We had the right connection on top of the design aesthetic. They’re an adorable couple. They’re really fun.”Spin Doctor Nestro says the wife loves the gray palette and she loves bling. “I definitely toned it down a bit,” she says. Men’s Club The library is the husband’s hangout. Grass paper walls and a wool rug lend texture to the space. The couple incorporated their love of Detroit with a Pewabic tile fireplace. Neutral hues set the sophisticated tone. The faux paint treatment on the ceiling was done on embossed paper to resemble tin. An orb light fixture and a distressed oil painting of a horse are among the striking details. Wallpaper covers one wall while the ceiling received a faux paint treatment. A two-tiered light fixture features a silk shade accented with glass crystals. The unique table combines a custom base from one source with a 60-inch mahogany top from another. The rings on the base echo the ones on the chairs. Sconces illuminate the room. “The house is so beautiful during the day, but it takes on a different look at night,” says Nestro. 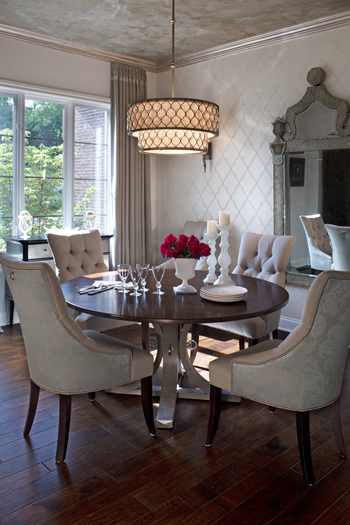 Shimmer and Shine The family room features a substantial light fixture that brings a little bling to the setting. Sofas and chairs complete the seating area that surrounds a cocktail table ottoman with a shelf. An outdoor lanai gets plenty of use. The TV and fireplace make it feel like an indoor space. A gray, geometric pattern on the off-white chairs echoes the tile on the fireplace from Virginia Tile. “I had pulled the tile for my client because it was perfect for the space. It has some real shimmer,” Nestro says. As it turns out, the wife had chosen the same one. Simply Bedazzling They knew they wanted to do something special around the stove. “Most hoods mimic the size of the range. We wanted to have a grand design,” says Nestro about the hood that was custom made and installed by MCM Stainless Fabricating in Hazel Park that also did the stainless steel rod hanger below. In the kitchen, a custom hood makes a statement above the stove. Beveled glass details add a lovely touch above the sink and the door walls while vintage pendants illuminate the island. 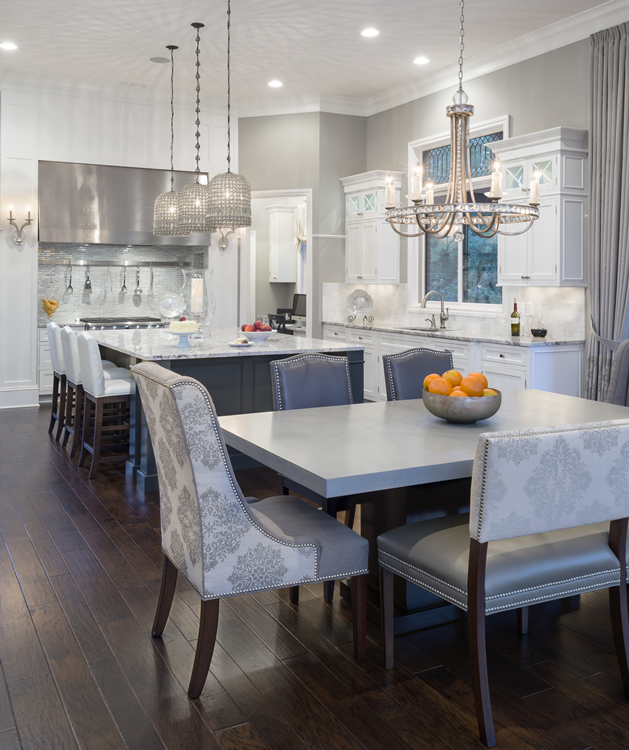 The kitchen table has an unobtrusive base that doesn’t get in the way when entertaining. Mixed seating includes a bench on one side, upholstered host and hostess chairs at either end plus side chairs. Upholstery consists of fabric and leather. Vintage pendants glisten from above the island where the granite counter was chosen early on in the process. The base is done in gunmetal gray. White cabinets pop against dove gray walls. Beveled, leaded glass appears above the sink and the door wall. “It adds a very lovely touch. They wanted something fun and different,” says Nestro.